Sick all week and taking Rock to the vet. I came down with a cold last Sunday and it has unfortunately stuck around for the past week. boo! The coughing all night and then sleeping all morning has really messed up my schedule, though it's nice to not have to wake up for a "day job." It's also nice to have a flexible schedule when you or someone in your family is sick, including your dog. Poor Rock dog has been limping off and on for the last two weeks, so we took her to the vet this week and she has a sprained leg. We are supposed to rest her for a week, i.e, no hiking, running or walking. With that restriction, I decided it was time to hike Roxborough State Park, which does not allow dogs, just southwest of Littleton, Colorado. You can check out my hike here. Now, I could have hiked with our other dog Belle, but that would be even worse for poor Rock, watching us leave on a hike without her. So I thought it was more fair to leave them both. Roxborough has a 7,000 foot peak that I have wanted to hike for a long time, but having dogs, I have never visited here....it's not as fun without them, of course! Even though I had this nasty cold, I figured I'd be ok, I took some dayquil and started out on the 6.4 mile hike. Even though I felt great on the hike, it didn't cure my cold and I am still feeling miserable a week later. The licorice and slippery elm tea is helping suppress my cough tonight and I hope it lasts so that I can actually get some sleep. I did create a couple of new items, though the skirt above is the only item that I have photos of right now. 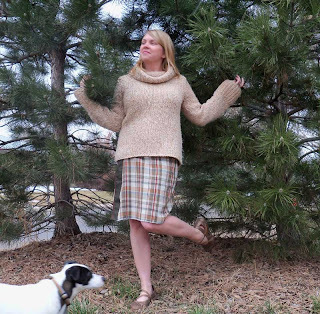 The skirt above is a Willow wrap skirt with two buttons making the skirt reversible, so that it can be worn with the applique in front or plain corduroy. Great for the office or a concert! I do take custom orders for this item if you are interested message me! 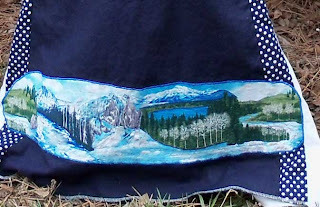 To the right is a photo of the quilted mountain scene on the hemp winter goddess dress available on my website. New 2010 Collection, buy handmade and pass it on! I am really excited to bring you my new winter/spring 2010 clothing collection. 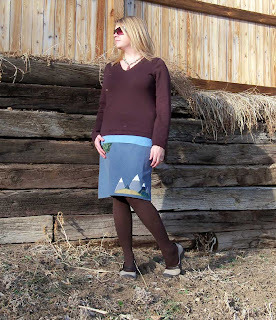 Lots of new skirts in fun new styles inspired by Colorado. 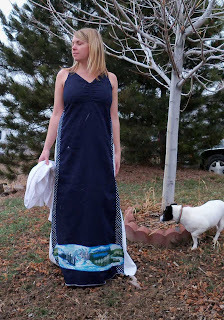 I have been hard at work stitchin' these new skirts and this beautiful winter goddess hemp dress! Plus, I have a couple pairs of pants and more items coming soon. My prices have been marked way down to accomidate the struggling economy. My hope for this low pricing. is to allow people to buy beautiful handmade clothes from an independent artist, rather than going to a store and buying things cheaply made overseas. Even though my items are slightly more expensive than storebought items, they are made with lots and lots of love and care :) Buy handmade and support independent artists!!! Pass this message on to your friends too! I cannot wait for the new site to be up and ready...I hope it will happen soon! 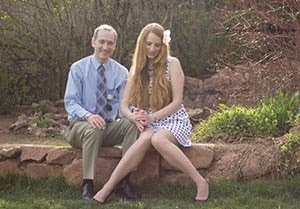 The palm tree skirt above is my new style of skirt, called the Willow skirt. This skirt is a wrap skirt with two buttons on either side of the wrap, making the skirt reversible. The skirt above can be worn with the palm tree in front, or just plain fabric in front. The skirt is super comfy and great to wear to work with a pair of tights or to your summer concerts! I love this style! 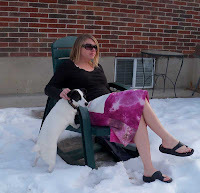 They are sooo comfy and I plan on wearing my reversible Willow wrap skirt this summer. Message me if you are interested in any of the above items! This was my first full week off work, and I must say, it didn't go exactly like I planned. It's really hard to give structure to your day and get the things done that you need, plus picking up the house, sewing, gardening, etc. It will take some time to adjust to, I guess. I did get a lot of sewing done earlier this week, and took some photos of the new items. But I still need to take some more pics today before I can post them all. Since I decided to quit my job to focus on my sewing and writing, I have been trying to decide where exactly my sewing niche will be. I love working with organic fabrics, hemp, and all eco-friendly; but I also have a ton of fabric already purchased that is not organic. But, I think creating an organic line of clothing will compliment the hiking/writing side of my business. After a lot of thought, I have decided to work with the fabric that I currently own and use it up as much as I can, but I will not purchase any more fabric unless its organic and eco-friendly or recycled fabric. I think this gives a good mix of using up what I already have and then only purchasing fabric that is organic. I mean, wasting fabric isn't eco-friendly, right? After coming to this decision, finally, I have been really motivated to sew and use up all this fabric that I have in my house, just so I can go ahead and buy more soon :) I love fabric! Tonight, my favorite band, The Bridge, comes in town for two nights. They are playing at Cervantes in Denver on Friday and Saturday nights. My cousin Patrick is the saxophone player for The Bridge, and Josh and I love to watch them whenever they come into town. Last summer we even traveled to Oregon to watch a few of their shows. They are *awesome* and you can check out their music on their website here.